In Café Scheherazade, Arnold Zable has harnessed anecdote and history – the realities of the Second World War and individual experiences of that war – to create a work of fiction that stands as a singular and eloquent whole. Weaving the factual and the invented, the author has created a work that crosses borders and boundaries, yet is entirely integrated and skilfully narrated. The Café Scheherazade of the title is a real place – an old Melbourne milk bar renamed after the heroine of the Arabian Nights. It is also the embodiment of an idea, an exotic name that asserts the centrality of story to life, indeed to individual survival. As Scheherazade herself was obliged to relate her tales, night after night, to appease the ruler who controlled her fate, the urgency to survive also motivates the taletellers who gather and recount their stories at this café in St Kilda, a portside suburb of Melbourne. Zable describes Melbourne as ‘containing the traces’ of many other cities, not least Odessa, a seaport on the Black Sea in Ukraine. Like that equally polyglot and maritime city, Melbourne has seen the comings and goings of people of all nationalities and persuasions. But unlike Odessa, this southern Australian city was spared the brutalities of the Second World War, becoming instead a safe harbour for thousands of traumatised and displaced survivors. And it is here, within this ‘new Odessa’, that the Café Scheherazade would eventually become a special place for the sharing of experiences, for individual and collective solace, and perhaps for some even the gradual restoration of identity. The book begins with a question – journalist Martin Davis finds himself interested in the name of the café and visits to ask how its owners, Avram and Masha, arrived at such a title. But instead of being given a short or simple answer, he is told he will only understand once he hears ‘the full story’. Having set out in professional mode, ‘in search of an intriguing tale’, Martin soon finds himself captured by what he hears. He returns to listen, again and again. Not only to the stories of the café’s proprietors but of its habitués, particularly the friends and old men Yossel, Laizer and Zalman. The tales recounted in Café Scheherazade prompt wider thoughts: on the nature of memory; the history and impacts of World War II; the Jewish experience of that war; the migrant journey; the idea of the city as a cosmopolis and a repository of much of what defines us as human; the diversity and indistinctness and necessity of what we each acknowledge as ‘home’; the importance of story to the individual self and of storytelling to our common life. But for all the book’s thematic diversity there is a common source: the tragic fact of war. The idea that war changes lives may be an unexceptional thought, but it is central to the stories of Avram and Masha. Early in Café Scheherazade, Masha says, ‘I never imagined that one day I would cook for a living… I always thought I would be a doctor… I studied medicine until the day I was forced to flee.’ Although she defers to Avram’s accounts in their conversations with Martin, Masha’s own story speaks to the fates that war generates. She was twelve when she, along with her mother, younger sister and brother, ran in fear from the Polish city of Sosnowiec in 1939. They eventually returned to Sosnowiec, but stayed there only until the Russians arrived – at which time they were sent away as ‘unwanted elements’ to a settlement in Siberia. The strategies and power plays of nations at war make their mark on these lives as on millions of others. By late 1941, two years into their imprisonment, the inmates were freed – a deal had been arranged between the Soviet Union and Poland, and Polish citizens in Russia were henceforth to be ‘regarded as allies rather than slaves’. From Siberia, Masha and her parents went south to Merke, a hamlet in southern Kazakhstan, where they were to spend the next three years in exile. Avram’s story begins in Vilna, ‘the Jerusalem of Lithuania’, where he was the son of revolutionaries who were members of a labour movement known as the Bund. When he takes to speaking of the past, he draws in the occasional selective anecdote, but what concerns him most is to give a full accounting. He is careful to chronicle his family’s connection with the ‘ebb and flow of history’, and concerned to show Martin Davis ‘data…and he is well prepared for the task…he covers the table with pamphlets and letters, journals and books…’. As well as facts, Avram employs the nuance, variation and illuminating detail of any skilled teller of tales. Martin Davis is right – story is the great ‘joiner’. Where events have acted to tear apart people and nations and lives, the shaping of a story towards relief and understanding – an end perhaps, but not always closure – is surely one of the greatest human arts. Café Scheherazade doesn’t strive for a fiction that is pure invention. Instead, fiction and biography and history are drawn in to build a novel where we observe fate, choice and morality in mighty contest. In this all-too-human competition, the acts and actions of characters present compass points the reader might use to orientate their own reactions – how we too might have behaved, or would behave, in such circumstances of life and death. It is not for nothing that the storytelling of Café Scheherazade takes place in one city and recalls events and times in other cities. A city may contain multitudes, yet for each person it possesses a unique scent and identity. We see the city’s more pleasing possibilities when Odessa is compared to Melbourne or Shanghai, but when the narration returns us to Vilna in 1941, and Avram’s efforts to retrieve his family and escape from the pogrom about to occur, we are reminded that cities are also often places of great disaster. So it was in September 1943, when the liquidation of the Vilna ghetto began with thousands put on trains to death camps or taken to Ponary to be shot. That month, when Avram and his ghetto fighter comrades prepared to leave for the forests, would be the last that he would ever see his family. Through the ordeal of fighting, he and his friends are hardened into different, less feeling creatures. ‘Placid family men became indiscriminate killers. Once pious scholars bellowed for revenge.’ Davis hears the steel in Avram’s voice as he speaks of the punishment he and his fellow partisans meted out when they joined the Red Army advance towards Vilna in 1944: ‘All I can do is listen at the table in the back room and allow the story to be told.’ In Vilna, ‘the beloved city that had been laid to waste,’ informers and collaborators were rounded up and executed. Eventually, Avram can no longer accept the act of killing. Unable to continue in the mode of brutal revenge that accompanied the Russian assault, Avram is given other jobs by the Red Army, but cannot do these either as he has lost ‘his capacity to feel’. He tries to function for a time as an intelligence officer, but suffers a mental breakdown under the accumulated weight of the horrors of the war and spends six weeks in a military hospital, putting an end to his intelligence work. Once again he is alone ‘and free of expectations, of all care’. He is still only twenty-one years of age. Avram comes to believe he and Masha might build a future in Poland after the war. But his political work and their lives there end in 1948, as the Soviet Communist Party is effectively in control of that country and the Bund to which he still belongs is targeted. The only route for him is an escape out of Poland and, along with that, a vow that he and Masha would meet in Paris, and there celebrate their reunion at the famed Scheherazade nightclub. Along with her family, Masha manages to get away a few weeks after Avram departs. It is to be no easy journey, but in 1949 they arrive in the City of Lights and – against the odds – make their rendezvous at the club. And there, as if in a dream, they listen to the violins and the music and feel themselves yielding to new possibilities, and together go to the dance floor. Some of the most moving moments in Café Scheherazade lie in the pages recounting the pain and difficulty these two wounded people experienced in accepting the chance and obligations of love. Despite the war having ended years before, Avram would still react on occasion as if under physical threat. Anger, and the memories of violence witnessed and committed, were still very close to the surface with him. But over time, feelings are more and more allowed in, a child is conceived and born, and ‘love is regained’. For these two, as for so many others – Holocaust survivors, refugees and displaced persons, the wounded and damaged of all kinds – Australia offered immense security after the tragedies of war. Masha may once have wanted to become a doctor, Avram may have wanted to teach, but here they could at least begin life anew. They would work at first in factories, laundries, abattoirs, until the possibility of the milk bar made coffee shop, the coffee shop made restaurant: ‘a meeting place, a refuge from the cold’, where ‘old worlds were being recreated, and festering wounds were being healed’. Their café would be its own borderless and free world – a small, self-contained universe where memories could be both kept alive and passed on. The book ends with a walk to the St Kilda foreshore, amid images of still air and a peaceful sea, ‘the calm after the storm… And seeing that the dawn had broken, Scheherazade fell silent, as at last she was at liberty to do.’ The duty to tell of these lives and those times has thus been discharged. The profound importance of maintaining memory infuses Café Scherehazade in ways that make the book itself a kind of recording angel. There is an insistence on the fundamental need to remember rather than forget what has occurred and what has been seen, and particularly what has been felt. The book directs us to the grief of those forced to leave home due to the threat or reality of various forms of moral and material violence. To forget the impact of war, economic suffering and state sanctions on those who came before us is to help prepare the ground for new kinds of imprisonment and punishment. In the book’s final pages, Zalman says that ‘memory…returned to me as I grew accustomed to yet another city. The space allowed it. The sense of peace fostered it.’ Here we are pointedly reminded of one of Australia’s best achievements over the past half a century and more – providing a haven for those who have come from elsewhere, often bearing wounds of one kind or another, and whose diverse cultures, histories and memories have (mostly, if not always) been allowed to be kept alive. Today’s world is a place of accelerating people movements, where borders are more often closed from fear of the other or otherness than for any good or rational reason. But if past conflicts have taught us anything, it is that we must make room for the markers of identity that matter to people – national, ethnic, sexual, religious and others – and yet privilege and elevate a shared humanity. That work is ongoing. 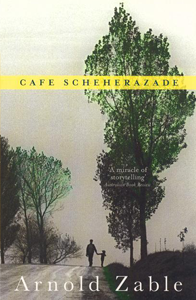 Café Scheherazade’s contribution to the task is to explain and celebrate the ways in which each life and its story is unique, and affirm that storytelling is central to all. Calvino, I 2009, The Path to the Nest of Spiders, Penguin Modern Classics, New York. Calvino, I 1997, Invisible Cities, Vintage Classics, London. Frankel, V 2006, Man’s Search for Meaning, Beacon Press, Boston. Levi, P 1999, If This Is A Man, Everyman’s Library Classics, London. Raizman, LS & Hollander-Goldfein, B (eds.) 2013, Narrative Reflections: How Witnessing Their Stories Changes Our Lives, University Press of America, Maryland. Young, JE 1988, Writing and Rewriting the Holocaust: Narrative and the Consequences of Interpretation, Indiana University Press, Bloomington. Wiesel, E 2006, Night, Farrar, Strauss and Giroux, New York. ANGELO LOUKAKIS has been a writer, teacher, scriptwriter, editor and publisher. He is the author of the fiction titles Vernacular Dreams (UQP, 1986), Messenger (Penguin, 1992), The Memory of Tides (HarperCollins, 2006) and Houdini’s Flight (HarperCollins, 2010). Angelo has also written a number of nonfiction works, including a book for children, The Greeks (Hodder and Stoughton, 1981), and a book of the SBS television series, Who Do You Think You Are? (Pan Macmillan, 2008). His collection of short stories, For the Patriarch (UQP, 1981), was winner of a New South Wales Premier’s Literary Award. He is currently Executive Director of the Australian Society of Authors.